Look to the nighttime sky on November 17-18 and you might be rewarded with a celestial light show. On those nights, the Leonid meteor shower reaches its annual peak and produces the highest number of meteors per hour. The shower is the result of Earth’s orbit crossing paths with the debris left behind by Comet Tempel-Tuttle. The dusty bits vaporize in the atmosphere to produce the brilliant streaks of light. 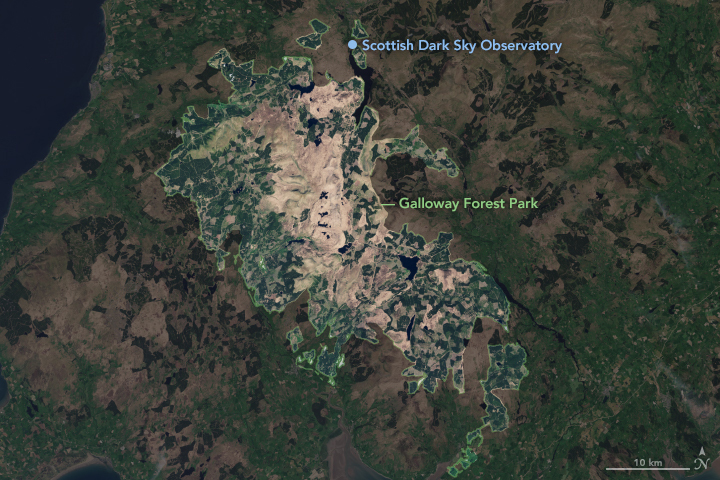 The top image, acquired May 24, 2018, with the Operational Land Imager on Landsat 8, shows a natural-color view of Galloway Forest Park. 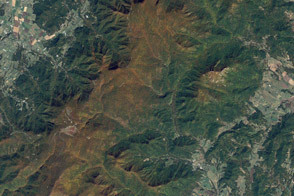 The park received its designation in 2009 by the International Dark-Sky Association. Located about 120 kilometers (75 miles) southwest of Edinburgh, the park spans 774 square kilometers (299 square miles) of woodland areas, moorland, and lochs. 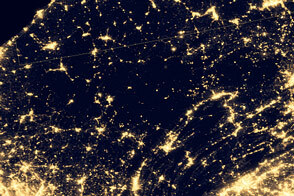 About 20 percent of that is “core” dark sky area, meaning there is no permanent illumination. There is even an astronomical observatory just north of the park. 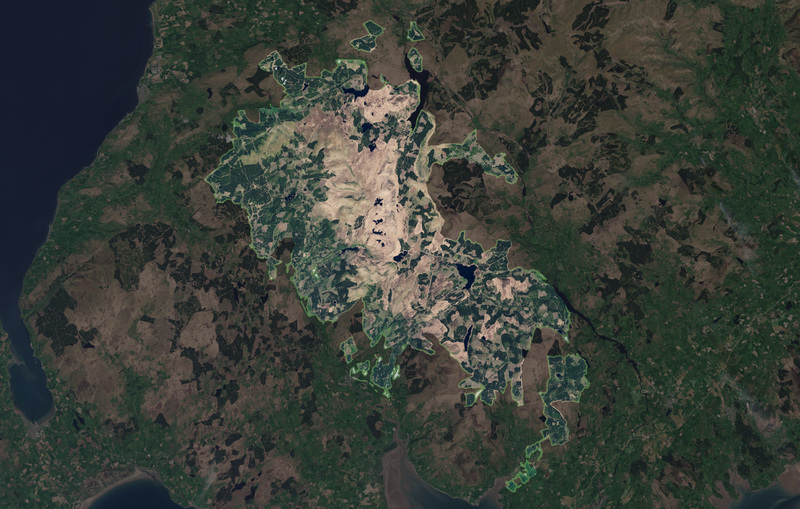 The remoteness of this area is particularly evident in the second image, which shows the pattern of human settlement across southern Scotland and northern England. The image comes from a global composite that was made by selecting the best cloud-free nights in each month over each land mass on Earth. 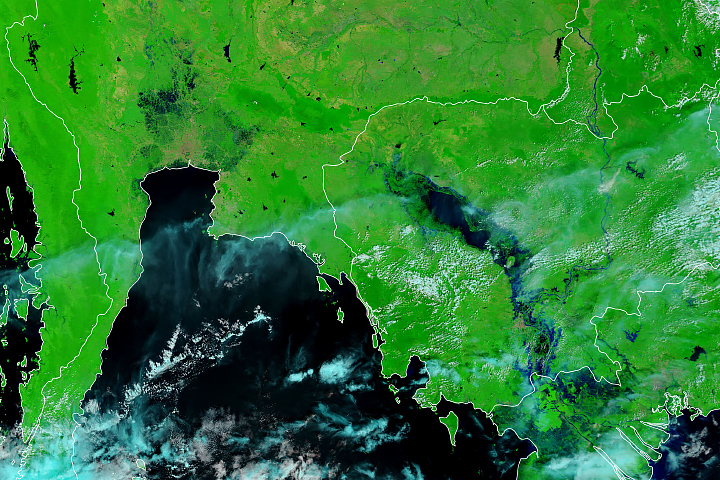 The data come from the Visible Infrared Imaging Radiometer Suite (VIIRS) on the Suomi NPP satellite. According to the International Dark-Sky Association, 90 percent of Europeans live amid night skies hampered by light pollution. Parks like this one preserve a place where people can get away from the glow of city lights and view the spectacles of the night sky, such as the Milky Way, satellites, meteor showers, and a countless number of stars. Of course, nowhere is the sky truly dark; celestial sources such as starlight and moonlight naturally light the sky. This year, the waxing gibbous Moon could outshine some of the Leonid meteors, making the pre-dawn hours after moonset a better bet for a good show. 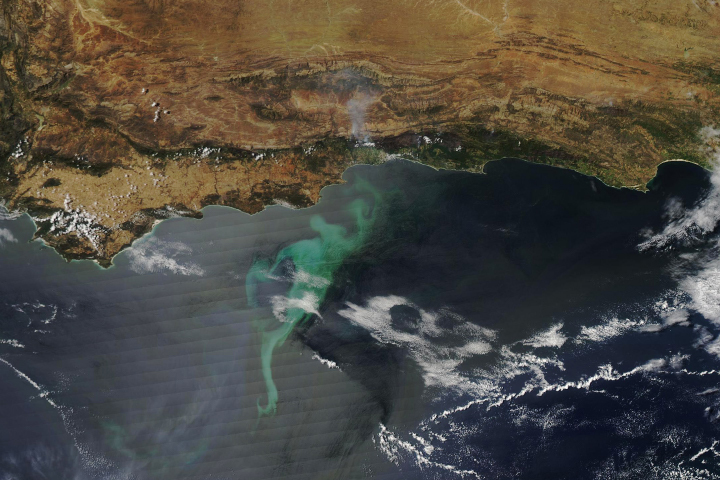 NASA Earth Observatory images by Joshua Stevens and Lauren Dauphin, using Suomi NPP VIIRS data from Miguel Román, NASA GSFC, Landsat data from the U.S. Geological Survey, and Ordnance Survey data © 2018. Story by Kathryn Hansen. 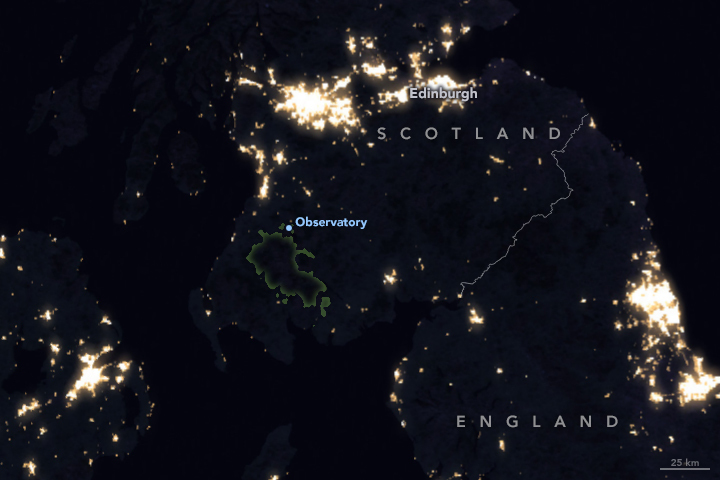 Meteor showers and other celestial phenomenon are easily visible from this dark-sky park in Southern Scotland. Atlas Obscura, Scottish Dark Sky Observatory. Accessed November 16, 2018. Welcome to the Galloway Forest Park. Accessed November 16, 2018. 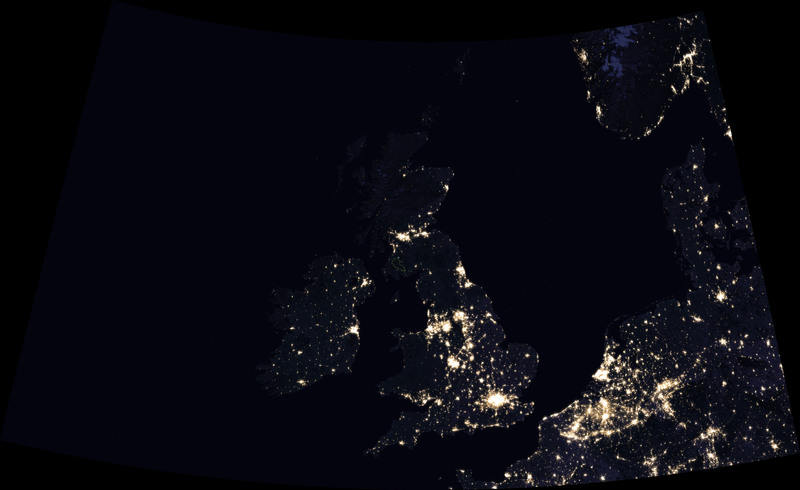 The Guardian (2008, December 23) Stargazing: Scotland prepares to host Europe's first 'dark sky park. Accessed November 16, 2018.
International Dark-Sky Association, Galloway Forest Park (Scotland). Accessed November 16, 2018. NASA Earth Observatory (2014, November 15) Dark Sky Parks. National Public Radio (2018, November 13) Watch The Leonid Meteor Shower This Weekend. Accessed November 16, 2018. Scottish Dark Sky Observatory (2018) Welcome to the Scottish Dark Sky Observatory. Accessed November 16, 2018.